If you’re planning a vacation to Xi’an and are in need of a Xi’an tour guide, we can help. We can provide many different services for tourists including tour guiding, interpreting, or business meetings. Maybe you are looking for Xi’an tours from Beijing, which is a common request we get. Beijing to Xi’an 1 day tours are something we can easily provide you. You may contact us at any time using one of the forms on this page. 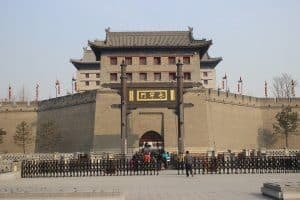 There are a lot of tourists spots inside the city, such as City Walls of Xi’an, Forest of Steles, Wulong Temple, Shaanxi Historic, Giant Wild Goose Pagoda, Grand Mosque and many others. Outside the city, we can explore the Terracotta Army, Qin ShiHuang Mausoleum, Huaqing Palance, Banpo Village ruins etc. Hiring a Xi’an tour guide will enhance your experience while exploring all these places. You can request for a free quote, and I will be happy to introduce you to more historical destinations with beautiful artifacts and significance. The main tourist attraction during a Xi’an tour is the “8th Wonder of the World”- The Qin Terracotta Army. Built during the reign of Qin Shi Huang, it is a site of thousands of life-size terracotta soldiers and horses, all standing in battle formation. It is one of the most incredible archaeological finds in the world. Terracotta warriors tours Xi’an is a very popular choice among tourists. Xi’an, formerly known as Chang’an in ancient times, is a city full of historical relics, sites and stories to tell because of its long history which is around 3,000 years old. It is the capital city of Shaanxi province and is one of the oldest cities in China. It is one of the most populous cities in Northwest China and over the years, this city has become the industrial, educational and cultural center of the central-northwest part of China. The city will give you a mix of both historical and ancient lifestyle experience along with a modern touch. The fertile land resulted in a number of dynasties ruling the region and a total of 13 dynasties had their capital in Xi’an. This makes Xi’an a treasure trove of historical sites and monuments. A huge number of about 4,000 tombs and sites have been excavated from this area. The city is so rich in historical heritage that there are no underground railways in the area since there is a wealth of ancient treasures which still needs to be discovered. Xi’an is a must-visit for the history enthusiasts who wish to explore China’s history closely. After seeing this, we can head over to the City Walls of Xi’an. Built during Ming dynasty in 1370, the wall stands tall at the height of 12m and 114 km in its perimeter. For a more adventurous experience, you can rent a bike and cycle along the walls and enjoy the beautiful view. The next spot should be the Great Mosque, famous for its mix of Islamic and Chinese architecture. It was built in the 8th century and bigger than most temples in China. The best time to visit this place is during spring when the magnolias (white and pink) fully bloom, giving a picturesque view of the mosque. Xi’an is noted for its unique delicacies and is also known as the “table delicacies capital”. A must-try is the Yangrou Paomo ( flatbread in a mutton stew), Liang Pi (cold noodles) and many others. The nightlife of the city is marvelous as tourists can view the night beauty of the Bell Towers and watch dance shows and other performances under the Giant Wild Goose Pagoda. To hire a Xi’an tour guide just fill out the form on this page to request a free quote.